As surely as Black Books is the reason we got a region free DVD player, Life On Mars is the reason we were meant to have one. But now, my law abiding subscriber, this too can be yours. Acorn Video is releasing season one of the original, Edgar winning series, Life on Mars. A grand excuse to sit up and revisit what is perhaps my favorite television since I, Claudius and most certainly “don’t miss TV”. Sam Tyler is a contemporary DCI on the track of a killer when he is violently thrown back into time. His I-Pod turns into an eight-track and Bowie belts out the title tune. Is it coma? Is it insanity? Is it that time just before the pearly gates where you ask who really shot Kennedy? Was Diana murdered? Where did I leave my car keys? 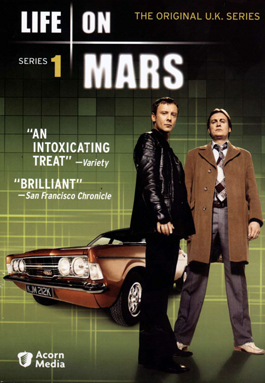 Life on Mars stars John Simm & Philip Glenister. They are the heart and soul of this 8 hours of television but their backup deserves kudos as well. Every role from small to large is played with gusto. They have excellent material to work with. Written by Tony Jordan, Ashley Pharoah & Matthew Graham each episode has its own arc but plays into Life on Mars long term story as well. Who is Sam Tyler and which childhood memories are true? When we first meet Sam we see a copper who’s become more of a case manager than police. He no longer listens to his gut. Gene Hunt his 1970s DCI and partner cop who’d be more than comfortable within the work of Bill James. He’s bent but not broken. Working together the two men find a balance of policing sure to satisfy any procedural fan. The music that pulses throughout the show is top notch and perfectly paced. The use of cinematography (watch for the greens and the reds) is top notch. The directors are top notch in the wrangling of this preposterous concept. It pulsates with vitality in every frame. Set direction is also breathtaking. It all comes together to create some of the most imaginative and rewarding television I have ever seen. Perhaps you’ve seen the American rendition and are thinking you’ll give Life on Mars, U.K. a pass. Do not deprive yourselves, readers. The scenes with the Ford Granada alone make this set worth every penny.